Our honorable Prime Minister Narendra Modi gave their contribution to the new form of India as in leading to the statement of “Making India”. It is great to work in a parallel phase with India’s contribution to the development of our country. To this, He also gave a recent quote to work upon as “IT + IT = IT”. 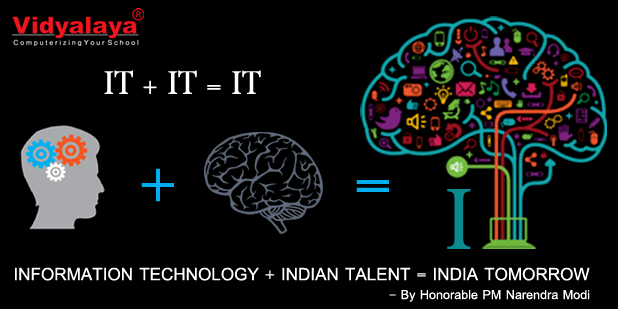 It defines the today’s science as in Information Technology Plus Indian Talent making India Tomorrow. Alternatives do come upon when we try something new but accepting it as a challenge is what we all try to do. Good, bad or different, if you are not investing in new technology, you are going to be left behind. Accepting it working on the same target is a huge thing, while mindset creates an issue. Our country is a vast population country where thousands of people live alive and everyone has a different mindset. Going to the path, our prime minister is more focused on the thing to change the mindset of people in one direction. This effort took him some harsh decision but gradually the thinkers came to the path which he was trying to put them on. He diverted his focused on technology just to make Digital India and that took a large input and got great output. He probably meant sharing of thoughts and as said sharing is good, & with digital technology, sharing is easy. A good vision and a truly good perspective by our honorable Prime Minister Narendra Modi. Allowing to questions he also said that anyone interested in sharing thoughts and brief new ideas should be able to connect me as well that too directly. He has faith in people and also my perspective says that “it’s not faith in technology. It’s faith in people”. A passionate audience can do great achievements but that is only possible when we have some faith in themselves. More the passion, More the achievements. Going to deal with technology is not an easy task as changes are necessary but in our country it’s voluntary. If it is relevant to usage and the priority is given to a particular group then and then only they are going to accept it otherwise there are many faults in an idea. India tomorrow pledge is unavoidable as it has many benefits rather than a hindrance. It can change the educational world with digitizing. Connections will build easily. Transparency between government and people. The biggest benefit would be changing the mindset of people and making it parallelly in the same direction. And the number one benefit of Information technology is that it empowers people to do what they want to do, It lets people be more creative, it lets people learn things they didn’t think they could learn before, & so in a sense, it’s all about potential, this will make India Tomorrow.